A San Francisco jury has acquitted the man who fired the shot that killed Kathryn Steinle on the city's waterfront in 2015, finding him not guilty of homicide charges. The verdict, coming at the end of six days of deliberation, is a surprising end to a case that garnered national attention because of the undisputed identity of the shooter. Jose Ines Garcia Zarate was convicted Thursday of a single count of being a felon in possession of a firearm but acquitted on charges of murder and manslaughter. His undocumented status and history of deportations and illegal re-entry into the U.S. sparked criticism of San Francisco laws prohibiting cooperation with immigration authorities in most cases. "From day one, this case was used as a means to foment hate, to foment division, and to foment a program of mass deportation," defense attorney Francisco Ugarte said outside of court after the verdict was delivered. "It was used to catapult a presidency along the philosophy of hate of others. ... Nothing about Mr. Garcia Zarate's ethnicity, nothing about his immigration status, nothing about the fact that he is born in Mexico had any relevance as to what happened on July 1, 2015. We believe the verdict is a correct and accurate reflection of the law and what happened on that day." President Trump helped stir national outrage over Steinle's killing as he campaigned for president. The firearm conviction carries a maximum sentence of three years in state prison, but could be adjusted upwards based on Garcia Zarate's previous criminal record, which included multiple convictions for illegally entering the United States. 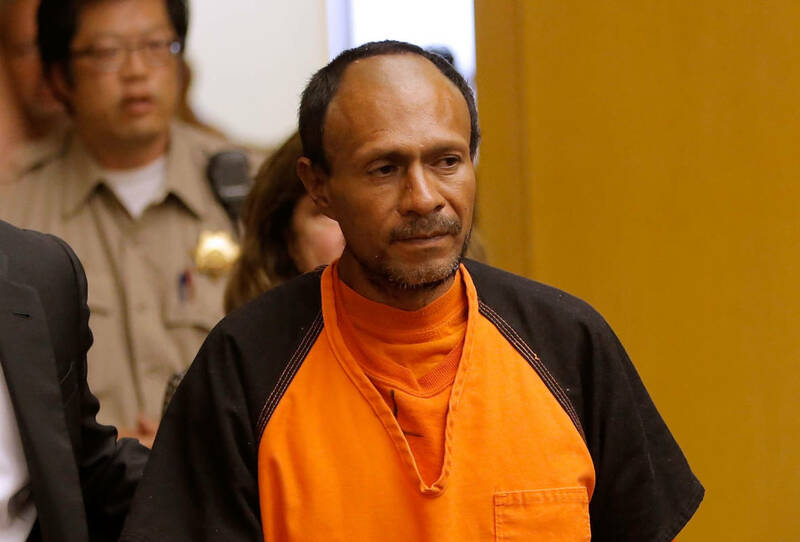 Any sentence will also credit Garcia Zarate for time served since his arrest shortly after he fired the shot that killed Steinle on July 1, 2015. 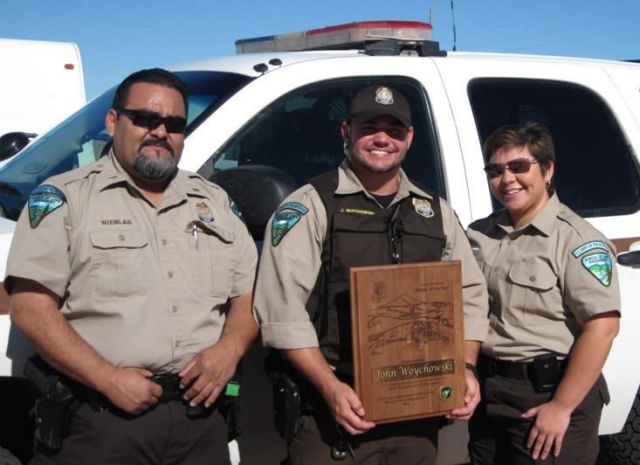 Prosecutors in the case had argued that Garcia Zarate fired a .40-caliber semiautomatic pistol -- a weapon stolen from a Bureau of Land Management officer's car in an unrelated auto burglary several days before -- with the intent to kill. "At the end of the day, this case really was a question for the jury," district attorney's spokesman Alex Bastian said. "The verdict that came in today is not one we were hoping for." 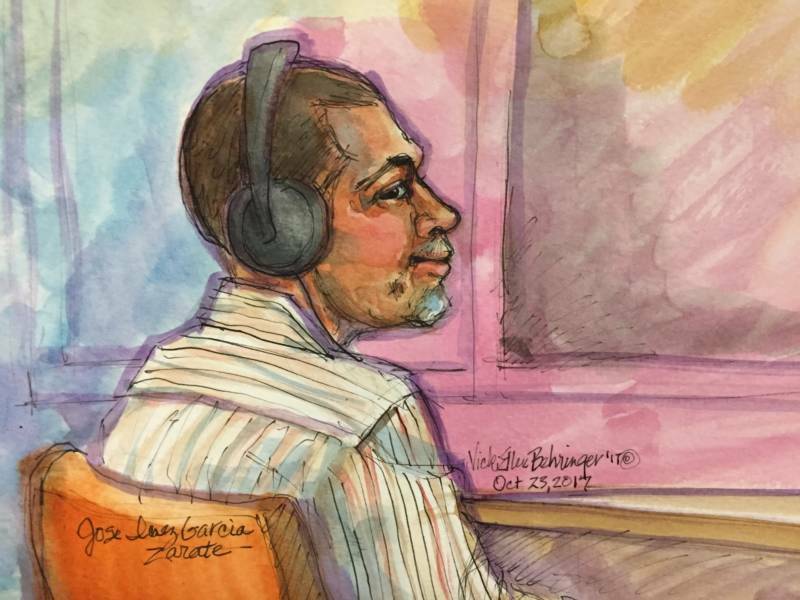 Although the homicide acquittals technically reflect only the jury's judgment that prosecutors failed to prove their case beyond a reasonable doubt, the verdict also suggests defense attorneys were successful in persuading the panel that the shooting was inadvertent: that Garcia Zarate found an object wrapped in a shirt near a pedestrian pier on the Embarcadero, that he didn’t realize the object was a gun, and that the weapon discharged accidentally. The shooting quickly drew national attention -- including that of then-presidential candidate Donald Trump -- as an example of violence committed by undocumented immigrants and enabled by so-called sanctuary cities like San Francisco. "He wasn't the only one to seize on the case to try to advance a restrictionist immigration agenda, but candidate Trump immediately seized on the Steinle case," University of Denver law professor Christopher Lasch said in an interview before the verdict. Lasch researched how Steinle's death has been portrayed by national politicians and news media. "This case was never -- sadly -- was never about Ms. Steinle. It was about the idea of a person who had been deported committing a crime. And no matter how much nuance you layer onto the facts after that initial characterization, the narrative won’t change." Lead defense attorney Matt Gonzalez had a message for the Trump administration after the verdict was read. "Let me just remind them that they are themselves under investigation by a special prosecutor in Washington D.C.," he said outside of court. "They may soon avail themselves of the presumption of innocence and the beyond a reasonable doubt standard, and so I would ask them to reflect on that before they comment or disparage the result in this case." U.S. Attorney General Jeff Sessions released a written statement criticizing so-called sanctuary cities within about an hour of the verdict. Steinle, who was 32 years old, was out for an evening walk on The Embarcadero with her father and a family friend on July 1, 2015. The trio walked onto Pier 14 a few minutes after 6 p.m., joining a scattered crowd of tourists taking in an expansive view of the Bay Bridge. They passed the man now known as Jose Ines Garcia Zarate, sitting in one of eight rotating steel chairs lining the pier's eastern rail. Steinle snapped a photo of her father leaning against the western rail, then a selfie of the group. A loud bang startled James Steinle, he testified on Oct. 23, and his daughter fell to the ground. 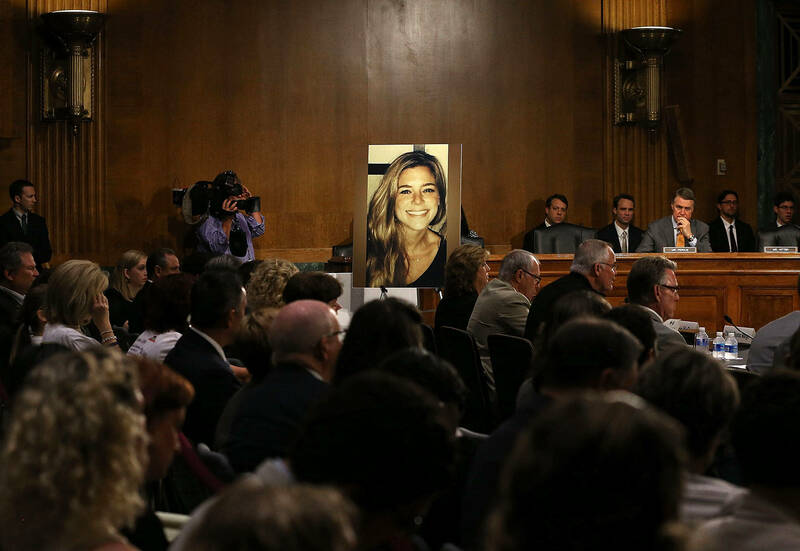 "She put up her arms and said, 'Help me, Dad,' " Steinle said. But there was nothing he could do. A .40-caliber bullet had ricocheted off the concrete pier and hit Steinle in the lower-right back, severing her abdominal aorta. She was pronounced dead at San Francisco General Hospital later that evening. Police arrested Garcia Zarate -- then known by the alias Juan Francisco Lopez Sanchez -- nearby within an hour of the shooting. In an overnight interview with two SFPD homicide inspectors and an officer translating between English and Spanish, Garcia Zarate gave a somewhat unclear and shifting account of his involvement in Steinle's death. He initially denied being anywhere near Pier 14, and continued that denial even after an inspector showed him a photo snapped by a tourist that captured him sitting in the spinning metal chair. He eventually told the police he found a gun -- what turned out to be a .40-caliber Sig Sauer semi-automatic pistol -- on the pier, wrapped in some sort of cloth. He said he threw it in the bay to "stop it from firing," according to the officer's English translation of Garcia Zarate's answers. The inspectors asked him what he was aiming at, and he confusingly said he was trying to shoot a "sea lion" or "black fish." Police recovered the weapon on July 2, 2015. During police interrogation, Jose Ines Garcia Zarate said "yes," he fired the fatal shot, but said it was an accident. Within days, the details of Garcia Zarate's immigration history and transfer to San Francisco began to surface. He'd been deported at least five times and had served over a decade in federal prison for illegal re-entry into the U.S. Since the late 1990s, he cycled through deportation, arrest at the U.S.-Mexico border and federal prison. But in March 2015, Garcia Zarate was transferred from federal custody to San Francisco to answer for a 20-year-old bench warrant stemming from a 1995 marijuana charge. The marijuana charge was dismissed the next day, placing Garcia Zarate in the middle of a national argument over immigration enforcement and the conflicting priorities of local law enforcement and the federal government. U.S. Immigration and Customs Enforcement requested Garcia Zarate be held for deportation, but San Francisco -- a so-called sanctuary city -- ignores those requests in the absence of a warrant or court order. With no legal reason to hold Garcia Zarate, the sheriff's department released him on April 15, 2015. He appears to have spent the next two months homeless, collecting cans along The Embarcadero so that he could earn money by recycling them. After Steinle's death, Garcia Zarate's mugshot became the face of what law professor Lasch says is a growing overlap between immigration and criminal justice in the U.S., with Trump leading the charge. "It was an opportunity to seize on this tragedy and turn it to their political advantage, and they do so by pushing a very cartoonish, a very two-dimensional understanding of what happened," he said, "that a young woman was killed by somebody who had been deported several times." University of San Francisco law professor Lara Bazelon agreed. "The case has become this kind of rallying cry for why sanctuary cities are a bad idea and lead to these terrible outcomes," she said. "So irrespective of the actual facts of the case, there was this bigger narrative about it that fit into the platform that Donald Trump was running on, which is that illegal immigrants come here and commit horrible crimes and our immigration system is broken and we need to expel these people. He used this case as an example of what he was talking about." But Garcia Zarate's immigration history and debate over sanctuary city policy was excluded from the criminal trial. "The jury is really supposed to focus on the specific facts and the crimes that are charged and the elements that need to be proved," Bazelon said. "None of those involve whether or not this person was documented, undocumented, the history of his being released into San Francisco -- legally speaking, those facts and the surrounding narrative about immigration in this country are irrelevant to the issues the jury has to decide." What the jury did weigh was Garcia Zarate's intent, called into question by his defense attorneys' arguments drawn from the police interrogation and the physical evidence at the scene. They argued throughout the case that the shooting was accidental, that Garcia Zarate didn't know what he was holding when he picked up a heavy object wrapped in cloth and that the gun unintentionally fired as he handled the bundle. "The hallmark of an unforeseen accident is often a confluence of forces coming together to cause an exceptional moment that afterwards, everyone doubts could happen," lead defense attorney Gonzalez told the jury during closing arguments. The defense called two firearms experts, one who testified about the gun's likely position at or below Garcia Zarate's knees when the shot was fired, initially flying toward the pier. The other testified that several aspects of the shooting indicated an accidental discharge, including a single shot being fired, the ricochet and no apparent motivation for shooting. The bullet ricocheted 12 to 15 feet from Garcia Zarate, then ascended at a low angle for another 78 feet before hitting Steinle. Since-retired San Francisco police crime scene investigator John Evans testified that the only reasonable interpretation of the shooting was that "a human being held a firearm, pointed it in the direction of Ms. Steinle, pulled the trigger and fired, killing her.” The defense attacked Evans' credibility outside court but was unable to impeach him in front of the jury. Among Gonzalez's "confluence of forces" is the origin of the gun. It was stolen from a U.S. Bureau of Land Management ranger's car four days before Steinle's death, but police couldn't find any evidence tying Garcia Zarate to that burglary or other related car break-ins. Gonzalez has said the thefts indicate the work of a professional auto-burglary ring, not his client, who has no history of theft or any violent crimes. Judge Samuel Feng instructed the jury to assume Garcia Zarate did not steal the gun. A defense video expert testified that surveillance video from about a quarter-mile away captured Garcia Zarate bending down just before the shooting -- though the blurry video excerpt was hard to make out definitively. He also testified about a group of six people who can clearly be seen gathered around the seat Garcia Zarate would occupy 30 minutes later, appearing to set down and pick up a number of objects. The defense implied the group could have been placing the stolen gun. Internal documents show U.S. Bureau of Land Management changed policies to require greater security of weapons after ranger's gun was used in San Francisco homicide. The U.S. government is a defendant in a separate civil case brought by Steinle's parents. The lawsuit alleges the BLM ranger negligently failed to secure his weapon, leading to the death of Kathryn Steinle. Attorneys with the U.S. Department of Justice and Department of the Interior unsuccessfully attempted to prevent ranger John Woychowski's testimony in the criminal trial and have attended most of the hearings. Despite joining with the federal government to oppose Woychowski's testimony, the prosecution eventually called Woychowski as a witness. In addition to testifying about his weapon, he confirmed he was not disciplined following the theft. KQED was first to publicly identify Woychowski and reported last month that he was promoted to a supervisory position five months after Steinle's death. During her closing arguments, prosecutor Diana Garcia demonstrated to the jury that the low-profile Sig Sauer P239 handgun -- Woychowski's smaller, backup weapon -- could have fit into Garcia Zarate's pants or oversized jacket pockets. She called the defense argument that he found the gun wrapped in cloth on the pier a "fiction," and that it's much more reasonable that Garcia Zarate found the gun elsewhere and brought it with him to the pier, intending to shoot someone. "I don't know why he did this," she said. "But when this defendant fired that gun, he did it in conscious disregard for every person on that pier." She continued: "He took the life of a young, vibrant, cherished woman by the name of Kate Steinle."